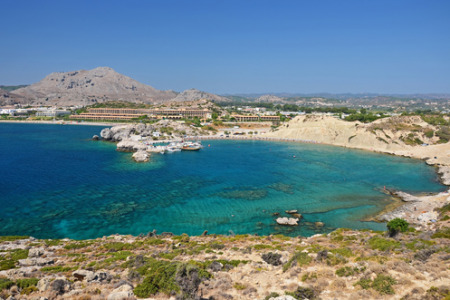 Kolymbia holidays transport you to the east coast of Rhodes, twenty-five kilometres from the medieval citadel of Rhodes Town. It is a picturesque resort with a warm welcoming atmosphere. Holidays in Kolymbia offer relaxing days by a sand and shingle beach with a guarantee of summer sun. We have a good number of cheap Kolymbia holidays which are considered great value as our standards of accommodation and service remain high. Holidays to Kolymbia can be taken from March until November when temperatures lie between twenty and thirty degrees. Our Kolymbia holiday offers are popular with families and couples looking for a relaxing break by the sea, where the beach around the bay offers safe bathing as well as a variety of water sports. Golfers will be pleased with the eighteen hole course in nearby Afandou, only eight kilometres away. Although there is limited shopping, Rhodes Town with its plethora of shops is a short bus ride distant. If you wish to avoid the vagaries of a British summer, and to chill out in attractive surroundings, you may be tempted by our Kolymbia holiday offers. For further information and to find our latest Kolymbia holiday deals, please use the search facility.